The exhibition of photos of the National Archives Building is based on the collection of Harry Easton, sculptor and stone contractor. The exhibit can be seen in the Community Gallery on the second floor of the museum from June 18 to July 18, 2013. It includes images of many of the Bedford people who worked on this historic treasure. 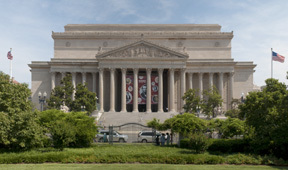 The National Archives Building has been called “An architectural gem in natural stone”, and represents the largest assemblage of cutters and carvers ever to work on a single project in the United States. Sixty-six men were employed, of whom thirty-one were carvers from Bedford, Indiana. Stone for the Archives Building was completely set before decorative carving was begun. Thirty-two columns, each with an elaborate Corinthian capital and pediment, give the Archives its design signature. Each capital is eight-and-a-half feet tall and located seven stories above the ground. Stones were roughed out in Bedford to reduce weight, set in place, then the deep layers of acanthus leaves and classic scrolls were carved from scaffolding. Completed in 1935, the Archives Building stands as a monument to the talent of American craftsmen, and the culmination of classical design in American buildings. The Archives Building is listed on the National Register of Historic Places. The National Archives was the largest carving project ever cut by Bedford’s craftsmen, and has been called ‘The art of stone carving at its best’. Click to return to the Community Gallery page. Click to return to the Photo Album index page.